I had a box of strawberries, about three cups and a cup of blueberries leftover. Nothing ever goes to waste. I washed and dried the fruit. Cut the strawberries up into 1/2 inch pieces. Sprinkled with sugar and set them aside. Line 12 large muffin cups with pretty muffin liners. 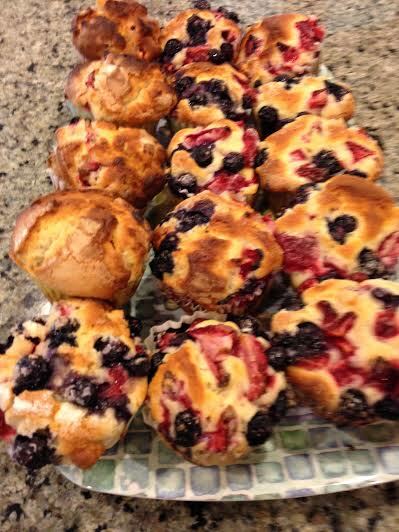 Mix the remaining berries with two teaspoons of flour and add to the batter. Fill at least 3/4 the way up. Make sure they are cooked because the berries make them very moist.